Aikido is a Japanese martial art developed by Master Morihei Ueshiba, 1883-1969. He was often called O’Sensei (Great Teacher) and had been exposed to martial arts since childhood. He became a renowned martial artist but he was not fully satisfied with himself or the traditional martial arts. He questioned the values of aggression, physical strength, and “victory” over others. He continued his search for the true and undefeatable martial art that unified body, mind, and spirit in accordance with the principles of nature. 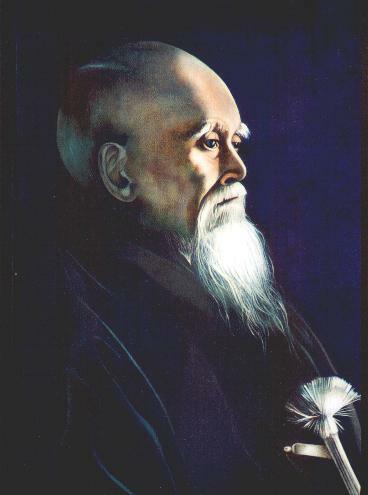 Through meditation, self-purification, and study, Master Ueshiba concentrated on understanding the spiritual world. The profound realizations that came to him gave birth to the original concept of Aikido. On a purely physical level Aikido is an art involving throwing, immobilizing, and twisting joints that are derived from Ju-jitsu and Ken-jitsu. Aikido does not focus on punching or kicking opponents, but rather on using your opponent’s own energy to gain control of them or to throw them away from you. It is not a static art, but places great emphasis on motion and the dynamics of movement. Aikido has no tournaments, competitions, contests, or sparring. Instead, according to the founder, the goal of Aikido is not the defeat of others, but the defeat of the negative characteristics which inhabit one's own mind and inhibit its functioning. At the same time, the potential of Aikido as a means of self-defense should not be ignored. One reason for the prohibition of competition in Aikido is that many Aikido techniques would have to be excluded because of their potential to cause serious injury. By training cooperatively, even potentially lethal techniques can be practiced without substantial risk. Another benefit of training in Aikido is the development of self-confidence. Since the essence of Aikido is derived from swordsmanship and not from bodybuilding, the smaller, more agile and responsive person has a greater advantage over a larger and slower adversary. Training is based on tai-sabaki (refined body movements), which develops your balance, agility, and elasticity. Learning traditional weapons, including the bokken and jo, teaches you distance, timing, speed, and one very important quality, perhaps the most important, communication skills through awareness. Aikido trains you to be strong yet gentle, relaxed and yet deeply alert and intuitive. Aikido creates no opponents, but unifies without resistance. Force is neutralized in a non-conflicting direction. You practice to match your movements with others by avoiding collision and conflict as well as to redirect the energy of others. In Aikido practice the student learns to be solidly grounded yet mobile. This is done by keeping the center of gravity very low through relaxing of the upper body, keeping the back straight, and breathing naturally from the center or the lower abdomen called “Hara”. The power generated is called kokyu-ryoku (breath power). O’Sensei called this extension the "circle of steel". Kokyu-ryoku means your extension of both your breath and your ki (internal energy). It is learning to coordinate breath with movement and it can also be thought of as your sphere. When you understand when to breathe in, and when to breathe out, Aikido becomes a moving meditation. Unlike muscle strength, Kokyu-ryoku does not deteriorate with age, however it increases as you train further in Aikido. You learn Aikido techniques cooperatively at a pace commensurate with your abilities. Everyone aims at the mastery of Aikido principles and techniques through continuous practice. It must be emphasized that there are no shortcuts to proficiency in Aikido or in anything else for that matter. Consequently, attaining proficiency in Aikido is simply a matter of sustained and dedicated training. No one becomes an expert in just a few months or years. Upon closer examination, you will find what you seek from Aikido, whether you find it applicable in self-defense technique, spiritual enlightenment, physical health, or peace of mind. O’Sensei emphasized the moral and spiritual aspects of this art, placing great value on the development of harmony and peace. "The Way of Harmony of the Spirit" is one way that "Aikido" may be translated into English. Although the idea of a martial discipline striving for peace and harmony may seem paradoxical, it is the most basic tenet of the art. The Samurai warriors were the royal bodyguards and army to the Shogunate (government). They were highly trained and skilled swordsmen. Being a swordsman not only entailed knowledge of the sword, but of many martial arts. One of these was Kyudo (archery), which was practiced from horseback. Actually archery was the original art of the Samurai, and the sword came later. The Samurai needed to know yari (lance), Ken-jitsu (sword technique), tai-jitsu (body technique such as pins and throws), calligraphy, music, and yes, even ikebana (flower arrangement). One was not considered cultured until mastering many of these and other disciplines. Our Aikido training is authentic and true to the Samurai tradition. It is not to be confused with other styles of martial arts that offer training as a sport or recreation. That is not to say that Aikido cannot be fun. On the contrary, learning something that helps you to grow and succeed can provide great enjoyment. You will learn the disciplines of the Samurai Warriors of ancient Japan. You will be introduced to body techniques with a heritage of a thousand years. You will be challenged in mind, body, and spirit. Through this program, you will grow and develop new and dynamic technical qualities. With continued practice you will discover qualities within yourself, which will bring harmony and reduce the stresses of daily life.